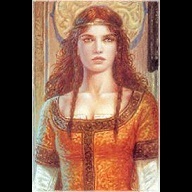 Andra is an Aes Sedai of the White Ajah. When were you raised to Aes Sedai of the White Ajah? I was raised at 5th Anni Party in 2006. It was an amazing experience to have at my first official event. I will never forget it. I chose White because... they were home to me. This was before the guesting system and we got to know the ajah's in the hallways only. I struggled between Brown and White for a month once I was Accepted. The official turning point for me though was because I went back through my dorm room and discovered that not only did more Whites post in there, to talk to me, but they seemed genuinely concerned about certain things that were happening in my life at the time. I received cheerful PMs and was accepted as I was before I was even in the ajah. NO! *laughs* Well, only in a small way. I am able to see the logical progression of things and figure them out. By book definitions I would probably be a Yellow. However, Jordan calls the White Ajah the Seekers of Truth, and I certainly believe in that. I am able to put my emotions aside (sometimes) to determine the truth. But as for the cold, unfeeling, no emotions whatsoever... That's definitely not me. Like a rock, as in a strong person, but I smile and cry a lot. I have to pull out my serene face only rarely... and not many people believe me when I do! But I am a calm person when necessary. I joined on January 15, 2005 so that means I hit my 5 year mark last month. This is the longest time I've been a member of anything resembling a 'club' though this is so much more than that. In the past I have served as the Heart of my Ajah, and at official events I am usually on a planning committee and I've been to several. My Accepted project was 5 chapter summaries. Mainly I'm just a member. A friend that I worked with recommended both the series and the site, and I became a member as I started reading Book One. Two weeks later I went with this friend and two others who were also members to a large Local Event where I met 20+ members including out Amyrlin, and I was hooked. My favorite Character is Nynaeve because she cares so much. She may not show it in a good way, but she cares a lot! I don't really have a favorite nation, though I find the Sea People Fascinating. I have attended Four Anni Parties, Three Dragon'Cons and 2 Fall Balls. Every party was different and special in it's own way. I greatly enjoyed the experiences I had. I think they really show how we as a Community can come together from all over the world and have a good time. I've laughed until I cried, Cried with friends, and enjoyed myself immensely. Country, and some popular. I like watching American Idol because of the good mix. :D I have Rock and Classical on my iPod. Anything but Rap and hip-hop really. The Princess Bride, LotR: The Two Towers, The Goonies, 27 Dresses, A Knight's Tale, Center Stage, Jurassic Park... So many more. I watch a lot of movies. I am a preschool teacher for children 16-24 months old. I get to play with them all day and get paid for it. It's awesome. HAHAHAHAHAHA! I have two dogs of my own, Pomeranians named Loki and Calliope. However, in my house there is also, a Rottweiler named Dozer, Two small parrots named George and Lola, a cockateil named Bodie, two Guinea pigs named Ox and PJ, a rat named Plague, various fish, and two turtles. I speak English, and took Spanish in high school and college. Now I can understand and speak it a very little bit. Alviarin because she's White and very very scary. Why not both? They have their benefits and suit different situations. I am 26, I live in California now, but in the past I have lived in New Mexico, Florida, Kentucky and Tennessee. I love animals and children. I read a lot, and I sing everyday. I teach a music class at the preschool an I love it. I have been several places across the United States because of choirs I've been in. I live with my parents, brother, and cousin. I have written many stories, haven't finished all of them, and hope to someday. This page was last edited on 20 March 2019, at 10:29.